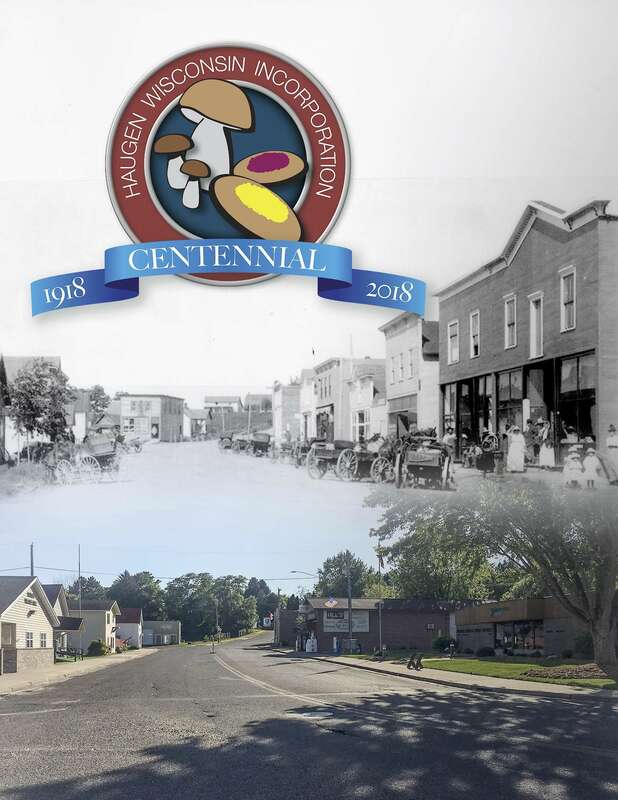 A celebration of the Village of Haugen, Wisconsin's 100th anniversary as an incorporated municipality is happening Saturday and Sunday, August 11 and 12, during Haugen Fun Days. Although the actual incorporation date was April 1, 1918, the celebration has been postponed to coincide with the village's annual summer festival. In commemoration of the anniversary, a book detailing highlights of the village's history with many historic pictures will be on sale for $5 each at the Haugen Area Historical Museum (311 Third St.) starting 10 a.m., the Saturday of Fun Days weekend. In addition, special commemorative coins will also be on sale for $10 each. Artwork on the coin depicts the importance of logging, farming, the railroad and Bear Lake to the life of the community. A formal centennial proclamation will take place just in advance of the Grand Parade at noon on Sunday at the grand stand on Haugen's "main drag", Third Street, aka Cty VV, in front of the Dairy State Bank. The name "Haugen" originates with United States Representative from Wisconsin Nils P. Haugen, a naturalized Norwegian immigrant living in River Falls. Haugen was the site of a logging camp and point of departure for floating logs down Bear Creek since 1879. It began to take shape as a permanent settlement with the establishment of a railroad stop in 1883. It's future as a stable community was further solidified with the creation of a post office in 1889. From days long ago, Sioux and later Ojibwa people came to the banks of Bear Creek at present day Haugen to camp during the wild rice collecting season. Earlier peoples formed burial mounds along the shores of nearby Bear Lake. Mostly Scandinavian loggers working for Knapp, Stout and Company were the first white people to settle the landscape. A few who remained in the area after the logging period was over were joined by an influx of people, mostly from Bohemia, who were lured to the area by promises of cheap land advertised in Czech language newspapers. Over the decades, the population has become considerably ethnically mixed, but maintains a connection to the days of a Czech majority with the slogan of being the "Mushroom and Kolache Capitol", two foodstuffs of importance to Czechs. In an interesting parallel, 2018 is also the centenary of Czech independence following WWI. October 28 is the day chosen to celebrate "Czechoslovak Independence Day". Over the Fun Days weekend, many other festive happenings will take place, including music, games and food downtown; and baseball games as part of the Independent League semi-finals happening at the Haugen Baseball Park on Cty VV across from Haugen's Bohemian National and Holy Trinity Catholic Cemeteries. Additional information about Haugen Fun Days can be found by visiting the websites www.facebook.com/haugenfundays, www.villageofhaugen.com, or by reading or listening to local media.